Sharing our experiences of 29 years in the manufacturing of Flange Guards, Stud Bolts & Fasteners. Bolts are extensively used as a fastener. They serve various purposes and there may be various types of bolts. We at Indiana Steel being in the steel business since long and are involved in the manufacture and supply of various kinds of fasteners includes bolts. Of the various types of bolts which are in use the HSFG bolts are widely used. These are on account of the properties they have. In this blog we will explain to you what they are and their properties and benefits of using them. HSFG bolts what they are? How they are made? High Strength Friction Grip Bolts are popularly known are HSFG bolts. They are made from bars of medium carbon steel. These bolts have great strength. Their high strength is built through the process of quenching and tempering. This process is also known as alloying steel. Steel washers of hard steel or carburized steel are provided to evenly distribute the clamping pressure on the bolted member and to prevent the threaded portion of the bolt from bearing on the connecting pieces. If the bolts are tightened by the turn of nut method, the nut is made snug and is tightened a half turn more by hand wrenches, then the washers are not required. The vibrations and impact resistance of the joint is also improved. The nut and head of the bolts are kept sufficiently large. This is done to provide an adequate bearing area. 2. When they are made the HSFG bolts, large tensile stresses are developed in bolts. This in turn provides large clamping force to the elements connected. High frictional resistances are developed. This therefore provides a high static strength the joint. 4. The frictional resistance is effective outside the hole. As a result of this lesser load is transmitted through the net section. The possibility of failure at the net section is therefore minimized to some extent by using HSFG bolts. 7. Cost gets reduced to some extent by making use of such bolts since fewer persons are require to make the connections. 8. Noise nuisance is not there as these bolts are tightened with wrenches. 10. Alterations can be done easily. 11. To acquire greater strength lesser number of bolts are required as compared to rivets. This brings in cost cutting. To conclude we can say that HSFG bolts have many advantages owing to their properties. This is why they are extensively used in all sectors. 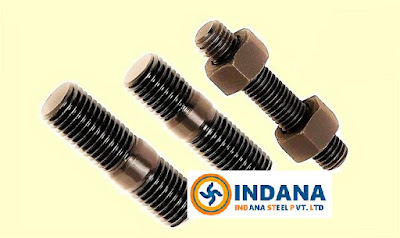 We at Indiana Steels are one of the leading manufacturers and suppliers of HSFG bolts. For more information about our products please visit our website. What machinery is required to manufacture nuts and bolts? What is the most commonly used material for nuts and bolts? What Are the Benefits Of Using Nut Protection Caps? Properties of Hex Bolts; why they are soimportant? Labels: What is HSFG bolts? Be it construction or any other major industry the role of nuts and bolts and other types of fasteners are critical. Thus they determine the overall strength and structure of the largest structures. So in case you happen to have your business in the manufacturing or construction sector we are sure that you would be interested to know what the commonly used materials for nuts and bolts are. So let us understand the different types of materials used. The different types of fastener materials usedFasteners are made with a wide variety of of materials . These include everything from common steel to titanium, plastic and other exotic materials. Some of these materials are again separated into different grades. This is done to describe specific alloy mixtures, hardening as well as processes involved. Apart from this some nuts and bolts are available with a variety of coatings or platings. This is done to increase the resistance against corrosion or alter the appearance of the fastener. 1.Price ? All our shields are very affordable...Infact we are the cheapest. 2.So are you compromising on the quality ? Absolutely not! All our Flange Safety shields are better than the best. 3.What is the guarantee? All our shields come with 18 months free replacement guarantee for you. 5.What is the shipment time ? Depending on the type of shield....immediate to 3 weeks..
6.What is the catch ? We work on low margins and reasonable marketing budget. 7.How do you accept payments ? We accept payments through Banks in USD. 8.Any hidden charges ? No! We are absolutely transparent and woman owned business. 9.Any Local taxes applicable ? No local taxes are charged. Flange and Valve wrapping! is it safe?